After you update, the App Store app will be in your Dock, next to the Finder. There’s a lot of variability. There are free apps, of course. But then, Apple’s Aperture is $80, Things and Acorn cost $50, Delicious Library sells for $40, OmniGraffle Pro will run you $200, and Distribute is listed at $700. Apple has priced its iWork apps at $20 each (twice the cost of the iPad versions), and its iLife apps at $15. Some developers have cut their prices, while others have kept them the same. It will take a while for people to figure out what the right prices for Mac Apps are in the Mac App Store. Apps download right in your Dock and then remain there once they're installed. No, once they’re in your Dock they behave like any other app. You can drag them out (or control-click and deselect Options -> Keep in Dock) to banish them. Yes. So far as we can tell, there’s no wall between money you spend in one part of Apple’s gigantic e-commerce empire and another part. If you’ve got a gift card to redeem, you can just click on Redeem in the App Store app and put in your codes, just as you would in iTunes or in the App Store app on iOS devices. Then again, we've also seen some people on Twitter report that the two stores may not be connected. We're just not sure yet. What about the five-Mac restriction that I have with videos I bought from iTunes? Does that work for Apps too? No. Apps don't check to see if you've using an iTunes-authorized Mac. They can ask you to verify your Apple ID and password, but that's a single check and it's just to verify you are who you say you are. Once your identity is verified, that's it. There's no authorizing or deauthorizing or counting of different Macs. Does that mean I could buy one copy of an app and install it on every Mac in my business? No, the license you agree to when you enter the Mac App Store says that app downloads are for Macs that you personally own, and that's a license for personal use. Apps that are intended for professional use are licensed for you or for a single computer used by several people. While there's no technical impediment to you installing them on multiple Macs at work, you'll be violating the license agreement. It's the same scenario as if you buy a single-user copy of iWork and install it on ten Macs at work—you can do it, but you're violating the license agreement, making the act ethically questionable. 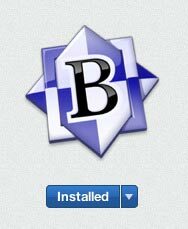 We didn't buy BBEdit on the Mac App Store, but it's installed.